29 years, 2 months, 29 days old age. Jayant Yadav will turn 30 on 22 January, 2020. Only 9 months, 1 days, 21 hours, 55 minutes has left for his next birthday. Jayant Yadav has celebrated the total number of 29 birthdays till date. See the analysis by days count and bar graph. 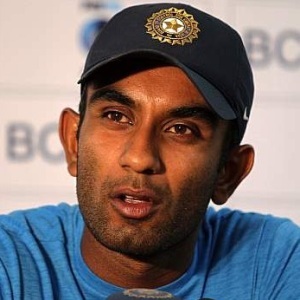 Jayant Yadav was born on 22-01-1990 in Delhi, India. He is an Indian Cricket Player. An offspinner from Haryana who can also bat in the lower order, Jayant Yadav made his first-class debut in 2011 at the age of 21. He picked up six wickets in that match, helping his side to a big win against Gujarat, but managed only one more in the two other Ranji Trophy matches he played that season. He was noticed for his batting a year later when he scored 211, his maiden hundred, against Karnataka, and shared a record-breaking stand of 392 for the eighth wicket with Amit Mishra. Yadav's fifth match in first-class cricket came against a touring England XI in Ahmedabad, where he took four wickets in the first innings, including that of Alastair Cook. His best Ranji season came in 2014-15 when he topped Haryana's bowlers with 33 wickets. He began the season with a six-for and went on to take 13 wickets in a match against Saurashtra in Rajkot. He has rewarded with selection for India A squad for home series against South Africa A and Bangladesh A. He started the 2015-16 Ranji season with his second first-class hundred while batting at No. 4, in partnership with his new Haryana team-mate Virender Sehwag. Yadav took a six-for in the same match in Karnataka's second innings and ended the season with another high, claiming eight wickets for Rest of India against Mumbai in the Irani Cup, and remained unbeaten on 19 when his side completed their historic chase of 480. Having been signed by Delhi Daredevils at the 2015 player auction, Yadav only played three matches in his first IPL season but showed he could be frugal, finishing with an economy rate of 4.14. At the start of the 2016 IPL season, Yadav's overall T20 economy rate was 5.62.